For those who have never read anything I’ve written about (you have lots of company), although not a religious person per se, I am very fascinated with places of worship. It’s has been nearly a year since I visited any of our area’s iconic churches. 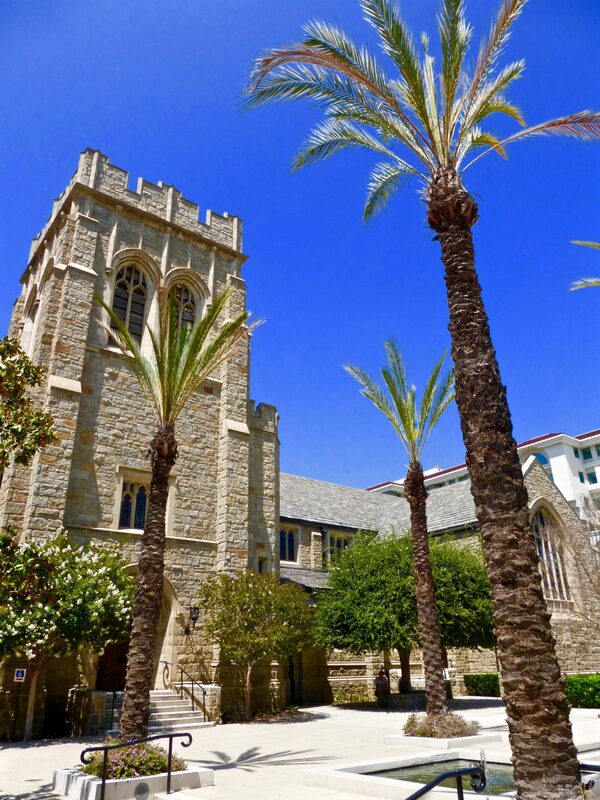 In the past, I featured a historic Roman Catholic Church in L.A. (St. Vincent de Paul); a gorgeous Greek Orthodox cathedral on the edge of L.A.’s Koreatown (Saint Sophia Cathedral); and Pasadena’s venerable Catholic church, St. Andrew. 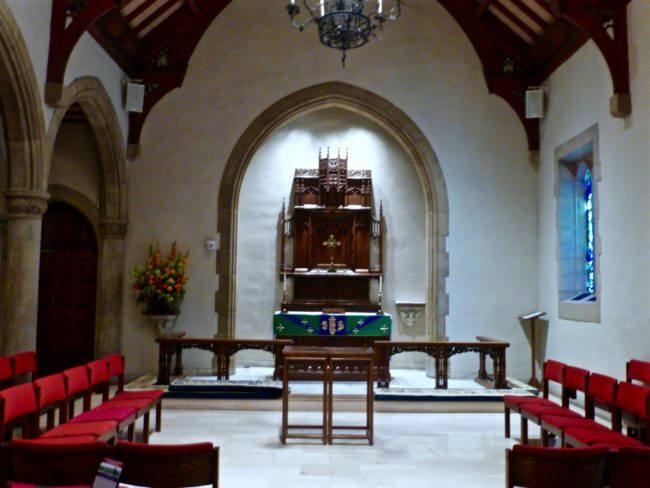 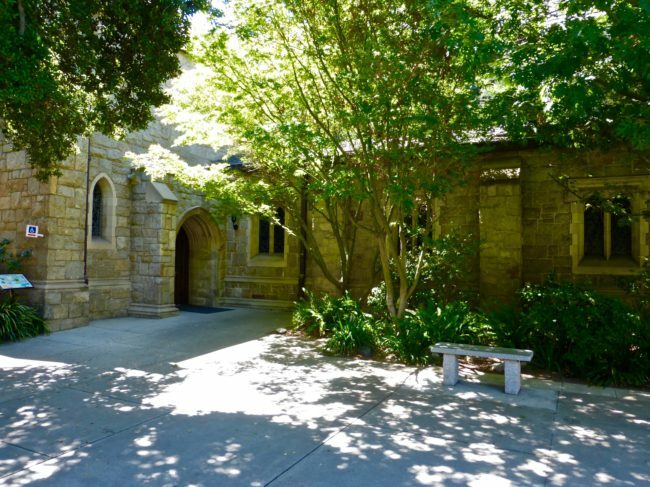 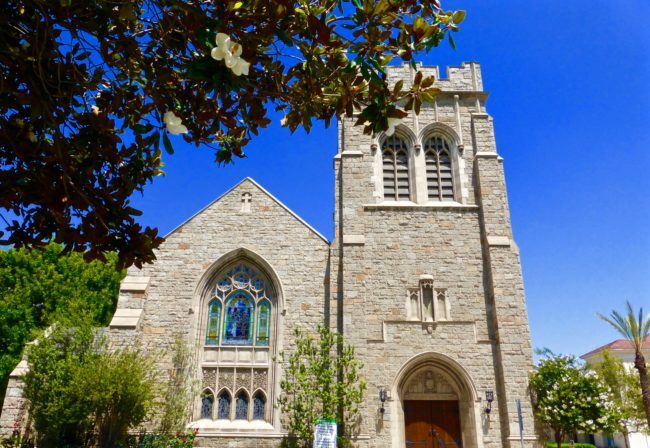 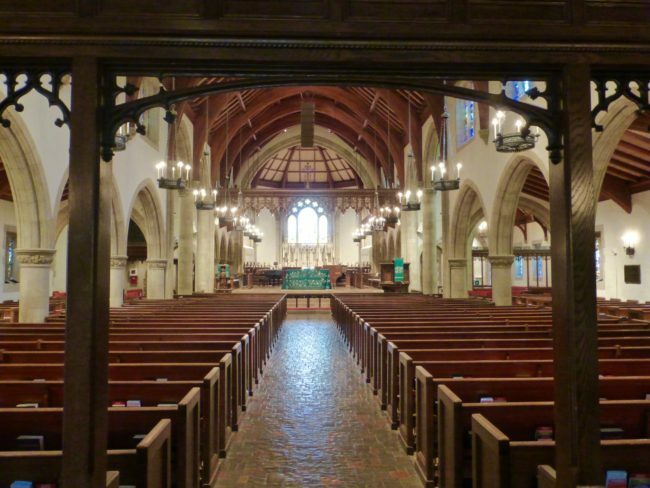 Today, it’s another historic Pasadena church, All Saints Episcopal Church, that I will describe (to the best of my ability). 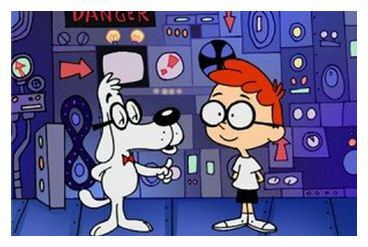 To find the origin of All Saints Church (the first Episcopal parish in Pasadena), you have to travel back to 1886, which unless you’re Sherman and Mr. Peabody with their “Wayback Machine” is relatively impossible. 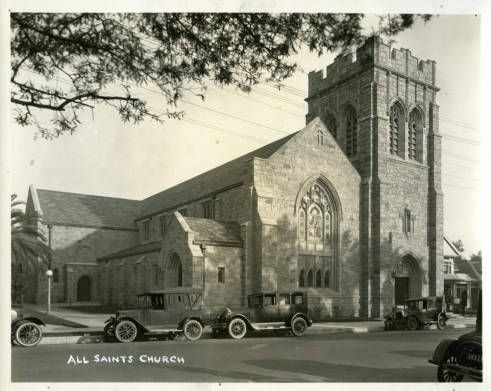 A church was constructed a few years later, but when the congregation became too large for that church, the “new” All Saints Church was built in 1923 and dedicated the following year. It was constructed of stone that was quarried from Bouquet Canyon in the Santa Clarita Valley and roofed with Vermont slate. The National Register of Historic Places lists the Gothic Revival All Saints Church. The design is attributed to architects Reginald Johnson, Gordon Kaufmann and Roland Coate (architectural firm Johnson, Kaufmann & Coate). I’ve always wanted to climb that tower. 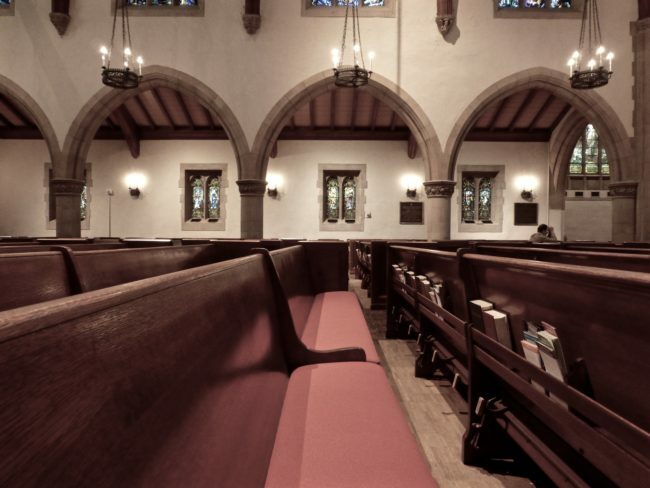 Although I have visited the church on a number of occasions, I have yet to find anyone in the office to give me any background. Using my sleuthing skills (ok I looked at the internet) I came as close as I can to be knowledgeable of what I witnessed inside thanks to the church website with the tiniest print on the face of the planet. 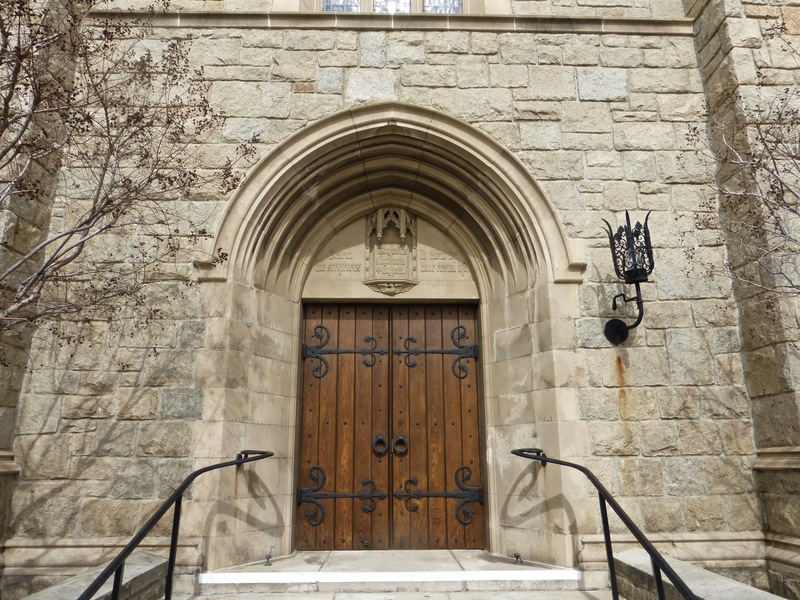 The doorways, with their cool arched doorways, have always intrigued me. These are the western and southern doors. 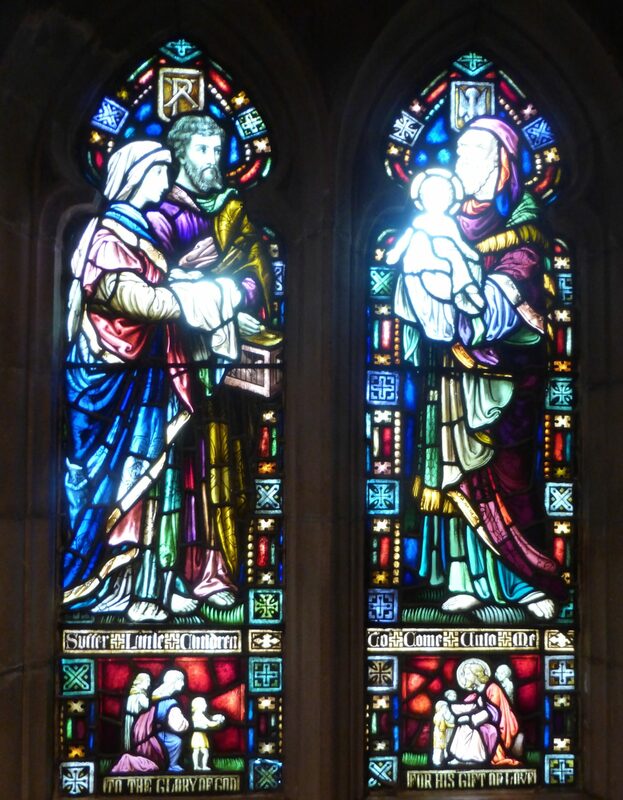 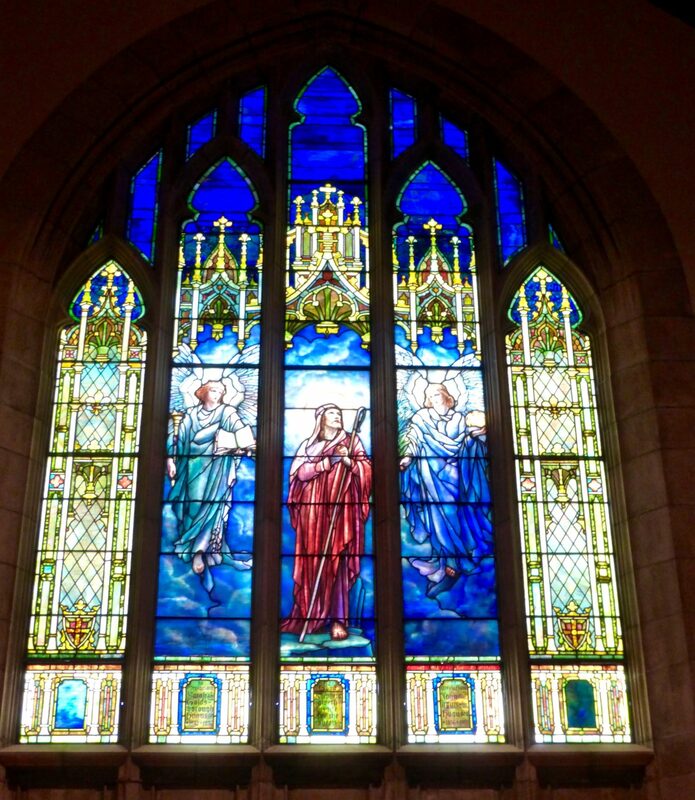 Throughout the church, you’ll find incredible stained glass Tiffany windows (some windows in the north and south transepts are actually from the original church built in 1889). 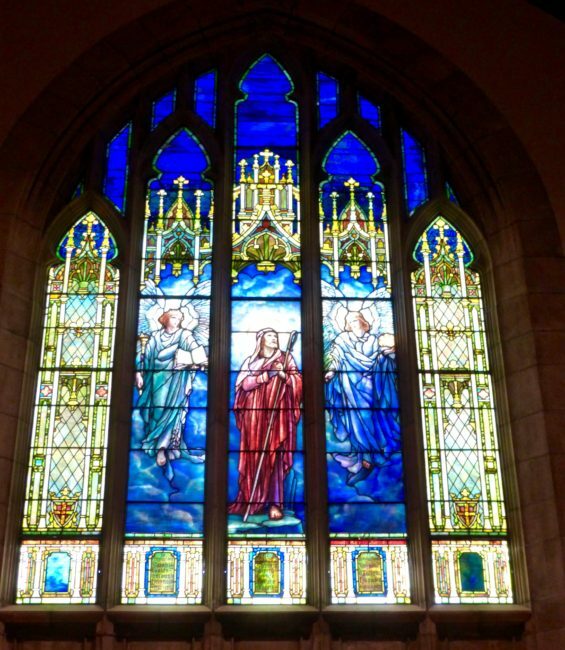 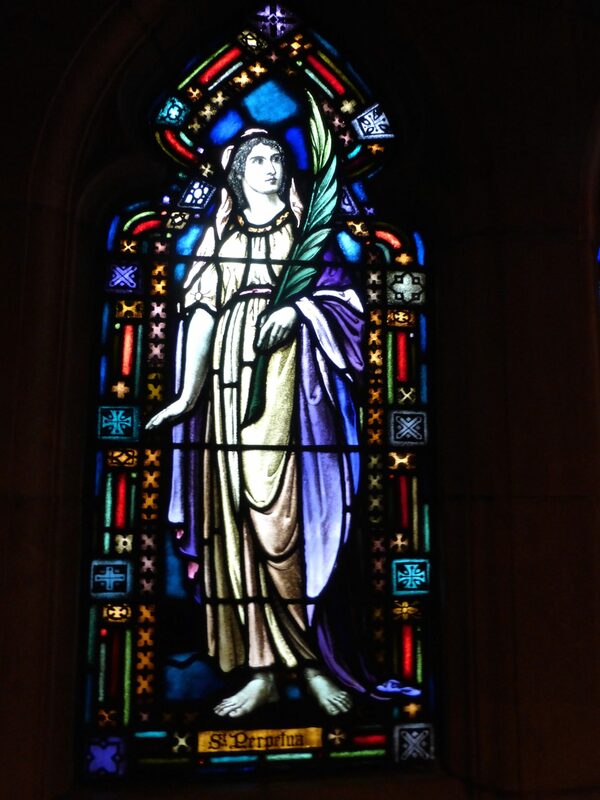 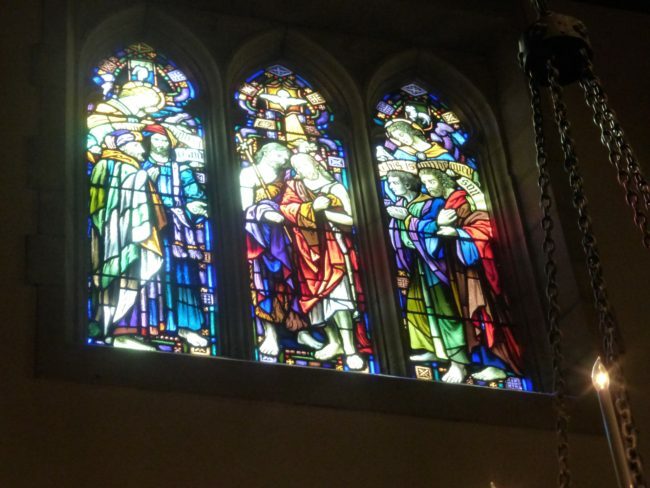 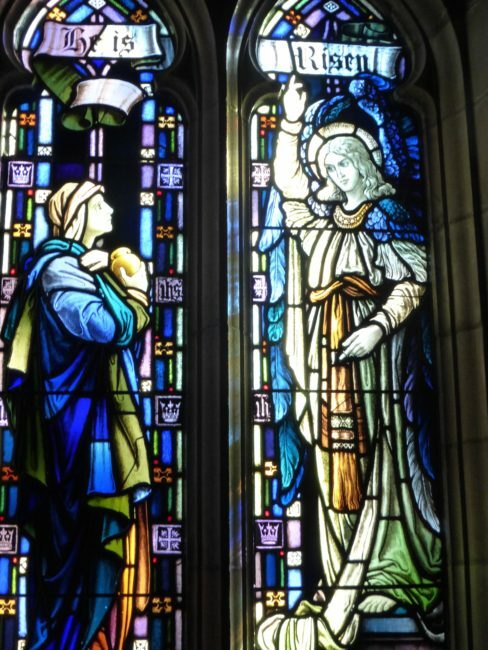 Judson Studios, a Highland Park fine arts studio that has specialized in stained glass for about 120 years, was very instrumental in the stained glass seen in All Saints Church. 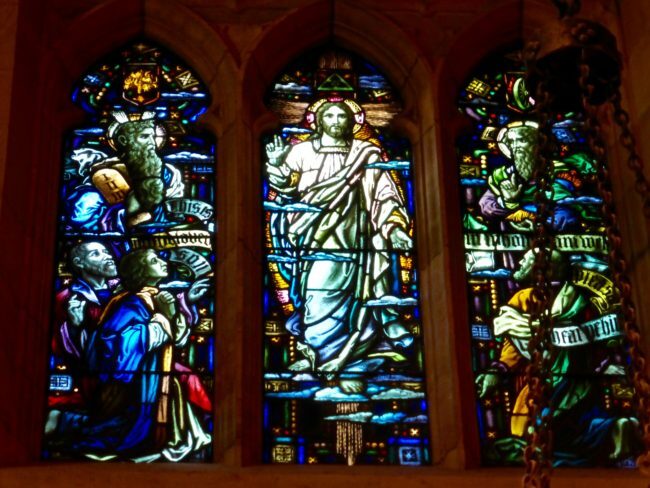 In its first century of operation, Judson Studios produced more than 10,000 stained-glass works. 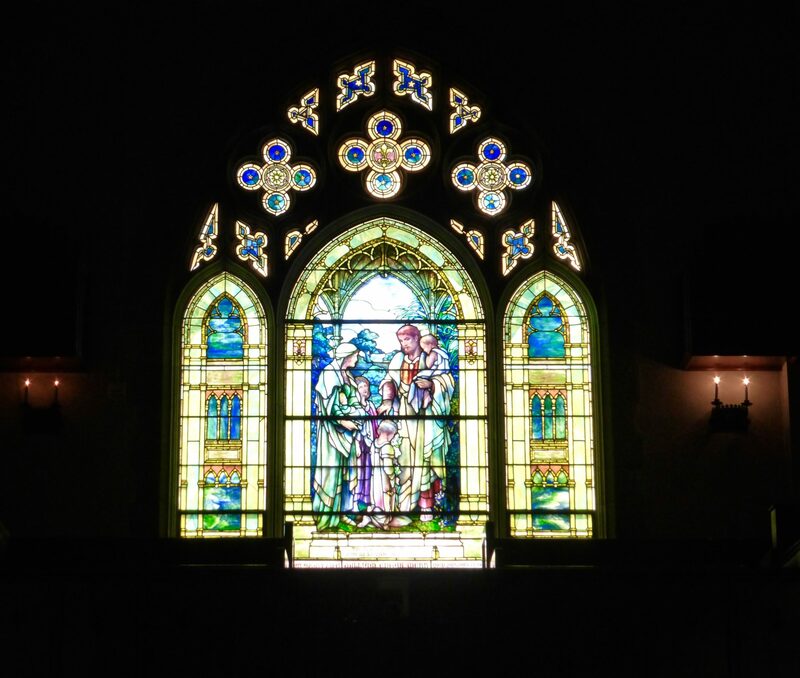 Looking at the back of the church (which I’m sure has a more formal name), I came upon some Judson Studios stained glass windows featuring four saints (well, it is called “All Saints”). 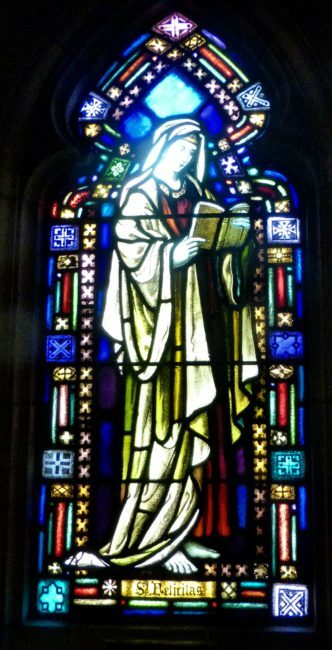 as well as St. Felicitas and St. Perpetua, which demonstrated that All Saints would well represent women of the early church. 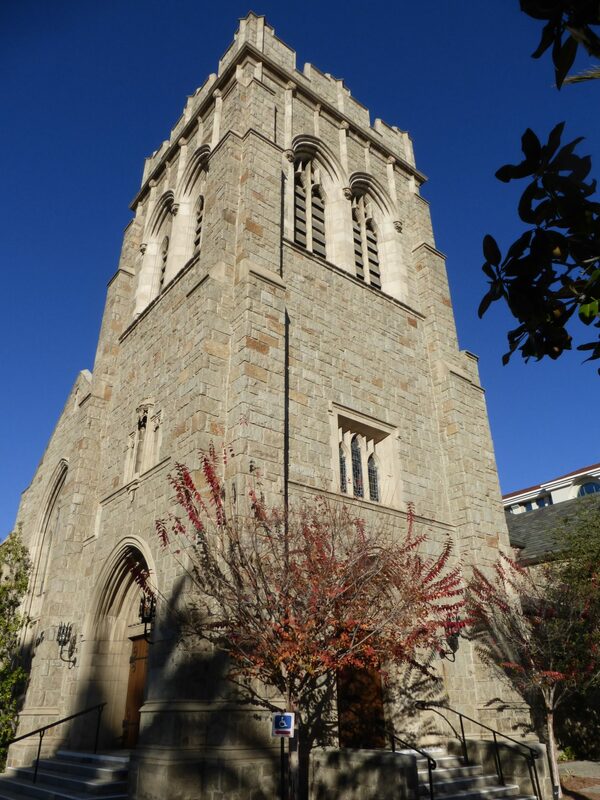 I climbed the stairs, hoping I could go up the tower. I ran into St. John on the way up. 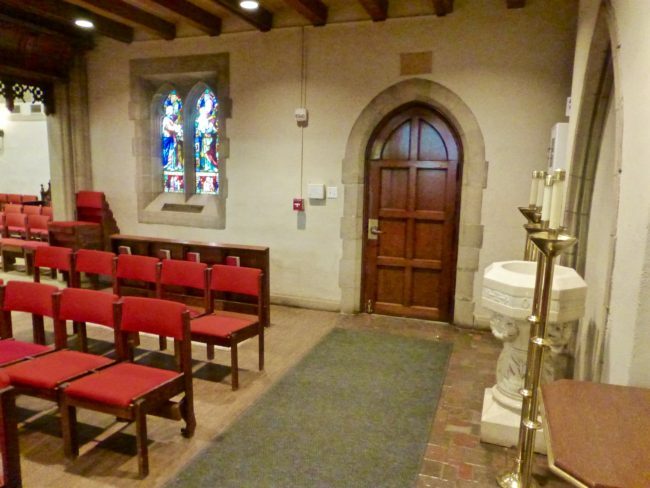 I reached a room that is All Saints’ columbarium, which holds the ashes of deceased parishioners. 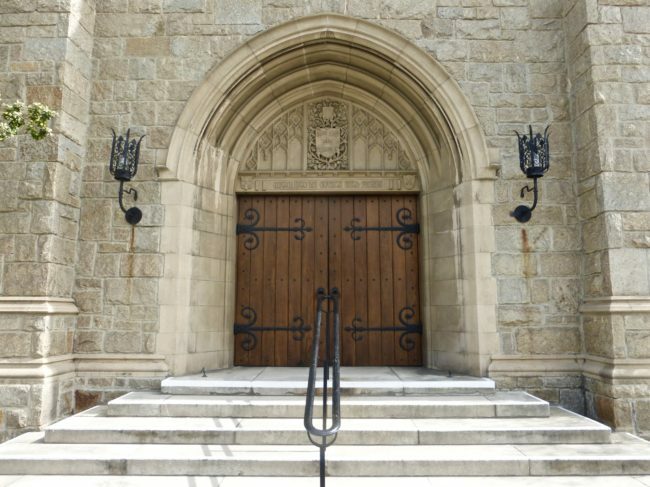 It was as far as I got because all the doors were locked. 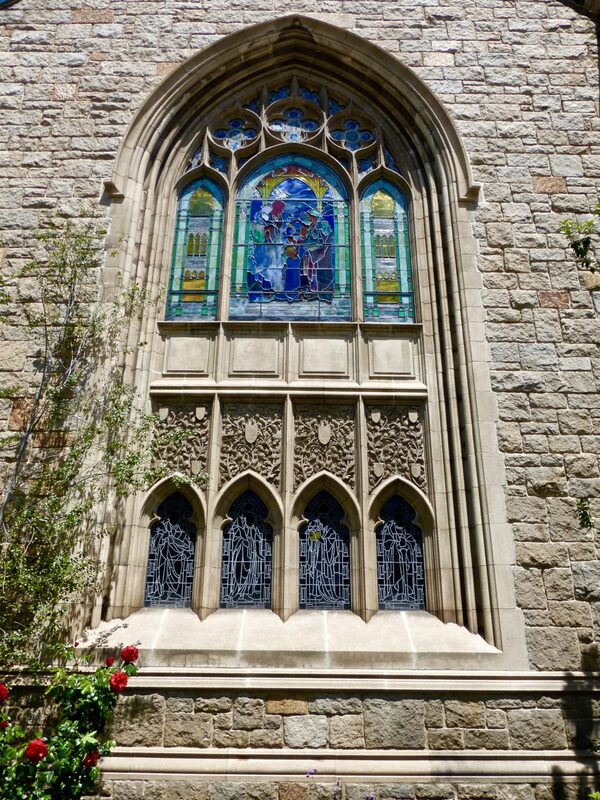 I’d like to return to get into the gallery and see if someone will let me climb the tower, always an adventure with me. 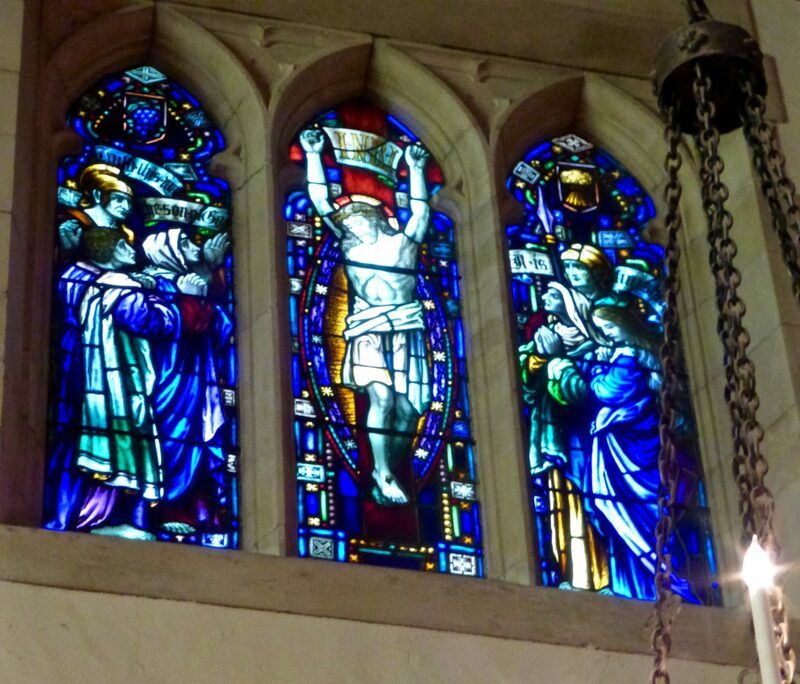 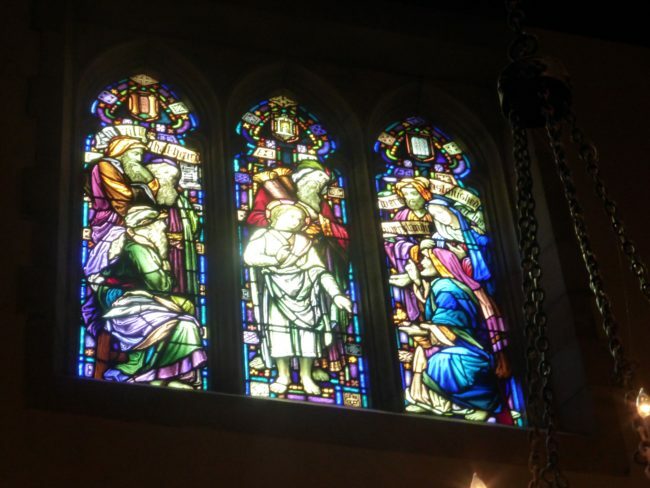 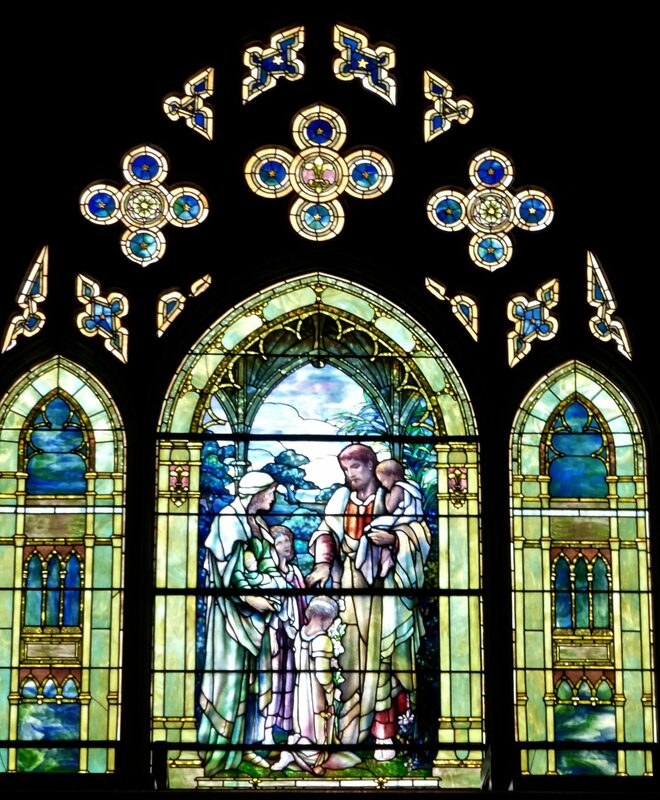 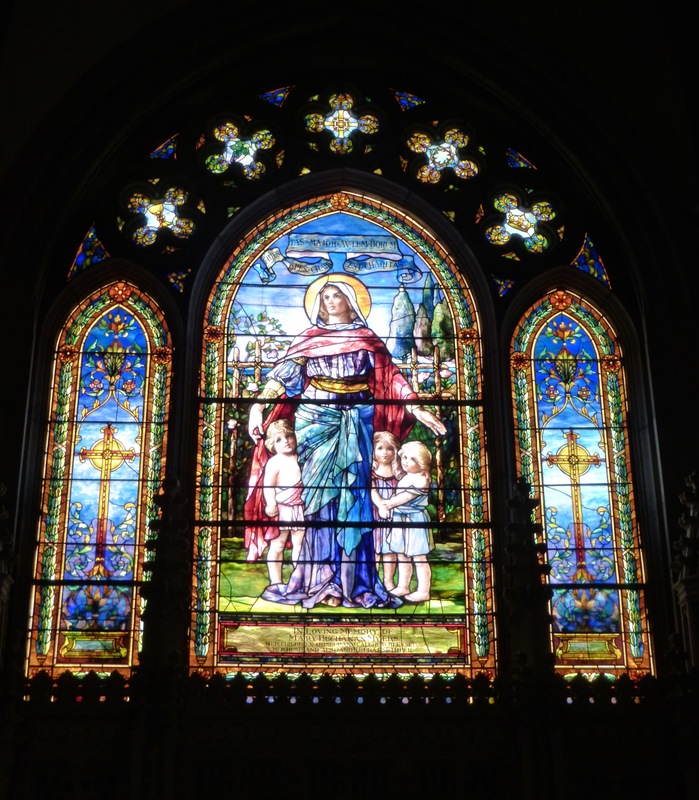 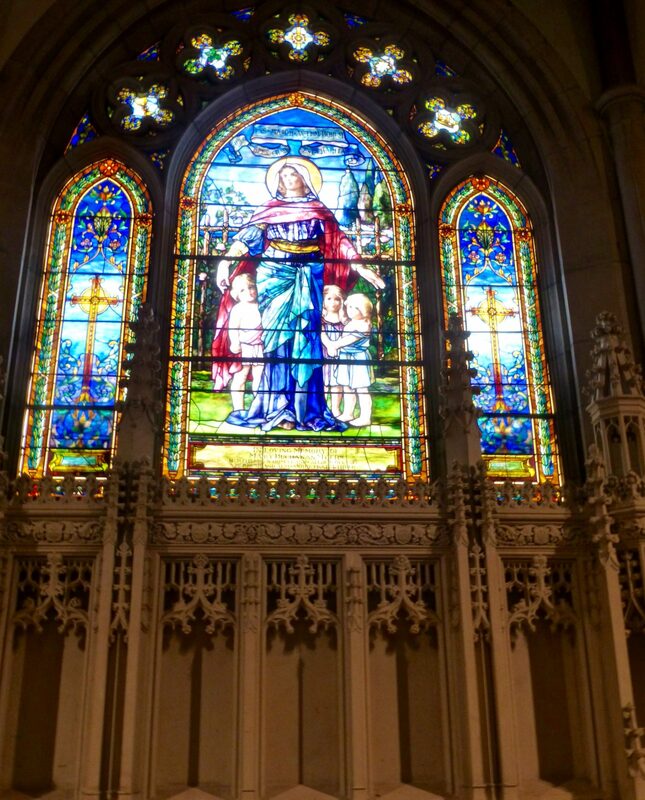 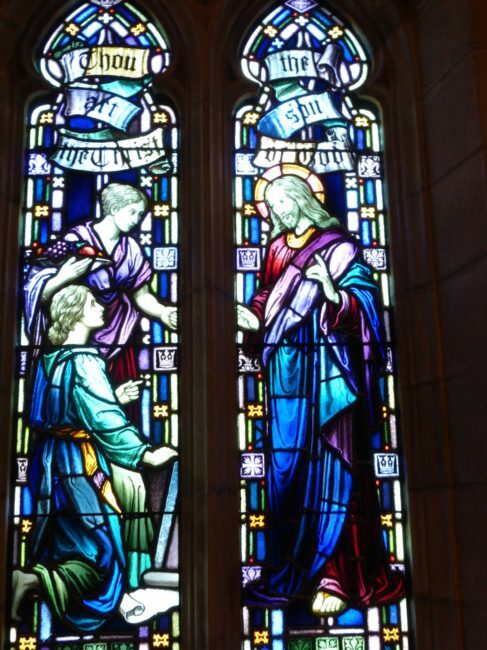 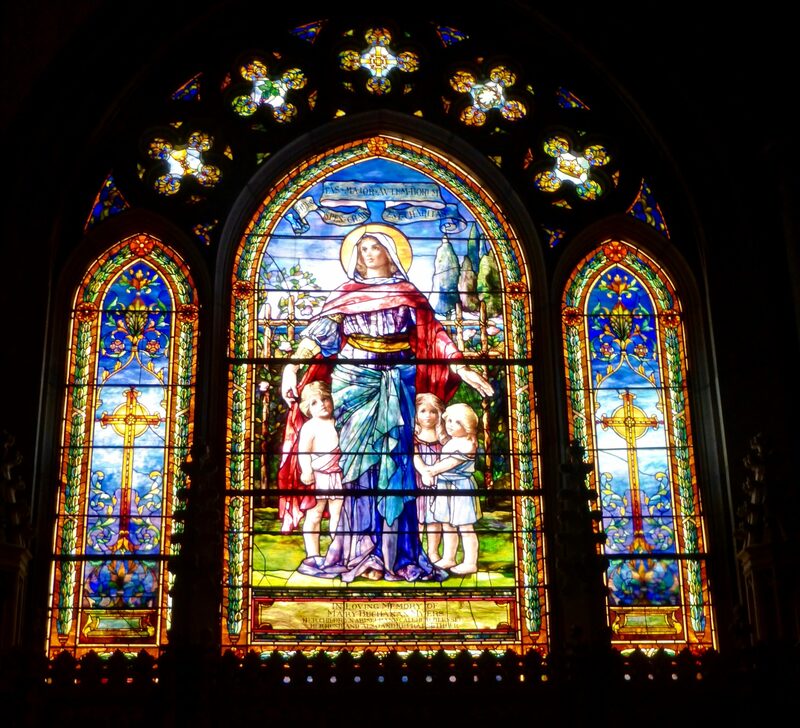 Back in the church, I walked down the center aisle of the nave, looked back (and up) to the Webb Window of Christ Blessing The Children, “designed and fabricated” by Judson Studios and utilizing Tiffany glass. Here’s the window from the outside of the church. 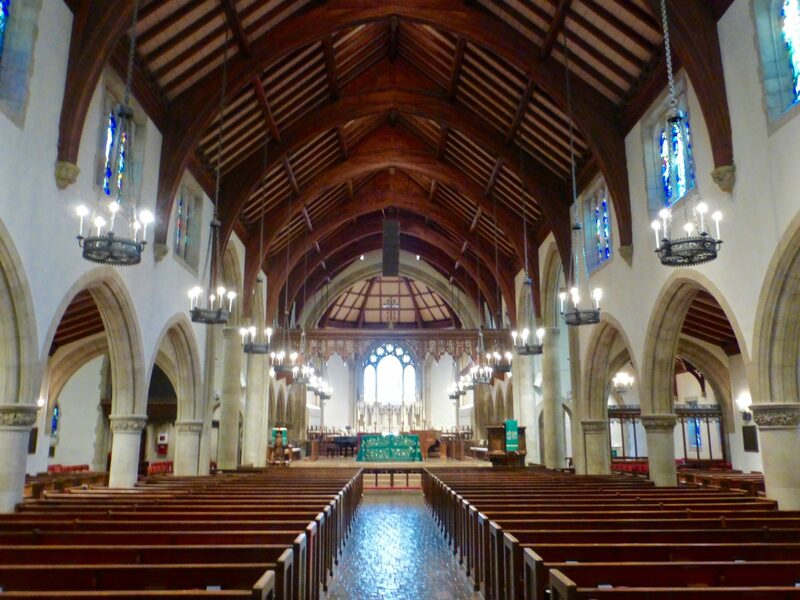 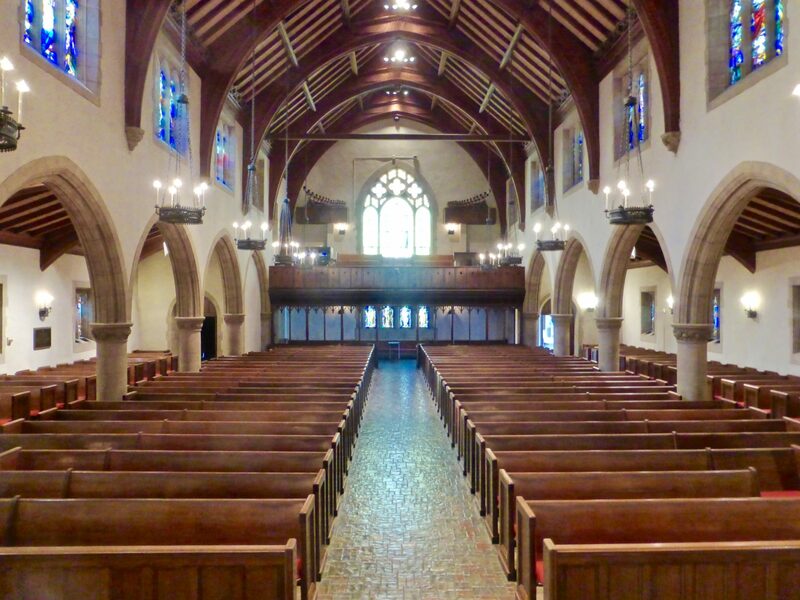 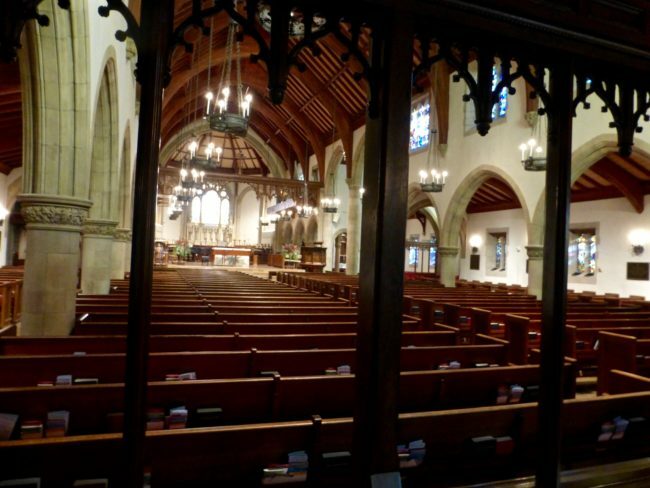 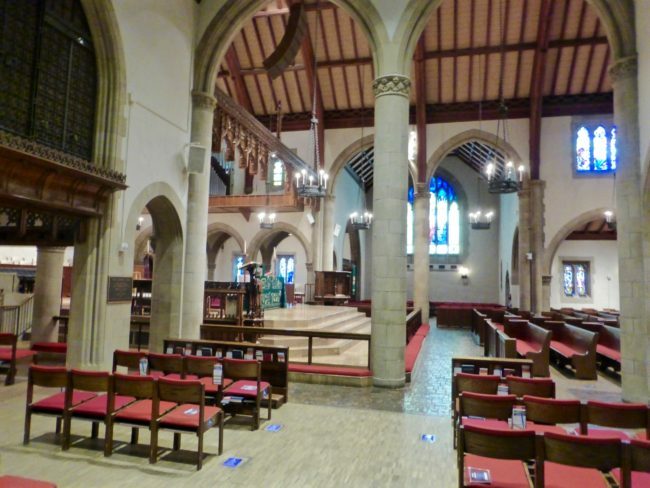 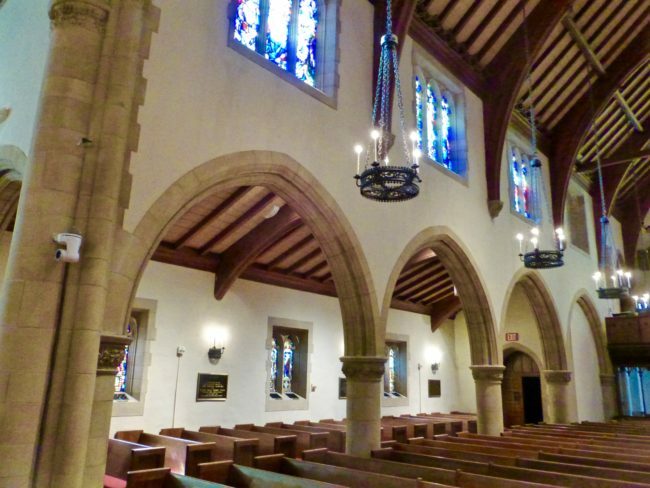 From the center aisle, you can see the beautiful clerestory (upper level) and the aisle stained glass windows. 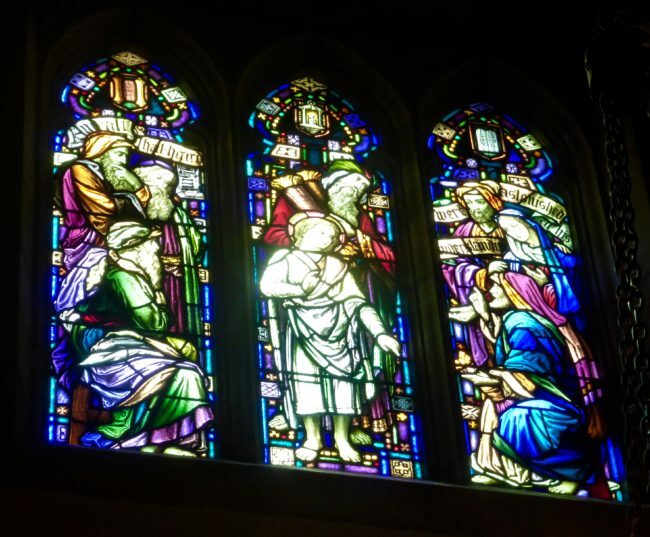 The stained glass windows on top tell the story of Christ. It was hard to get a good angle for photos. But I did the best I could with my limited photographic skills. 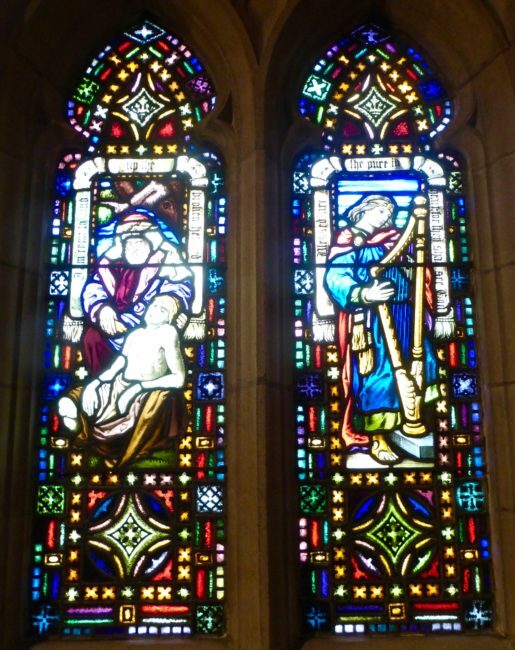 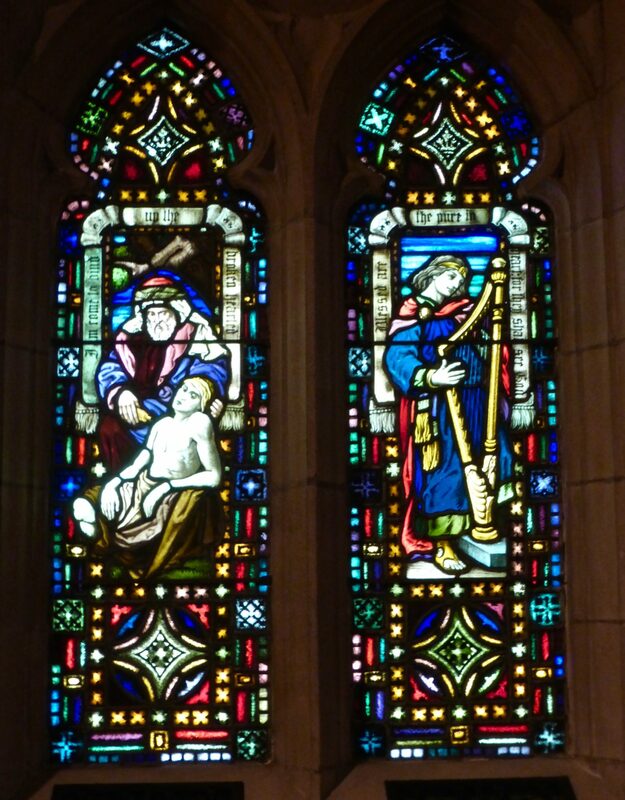 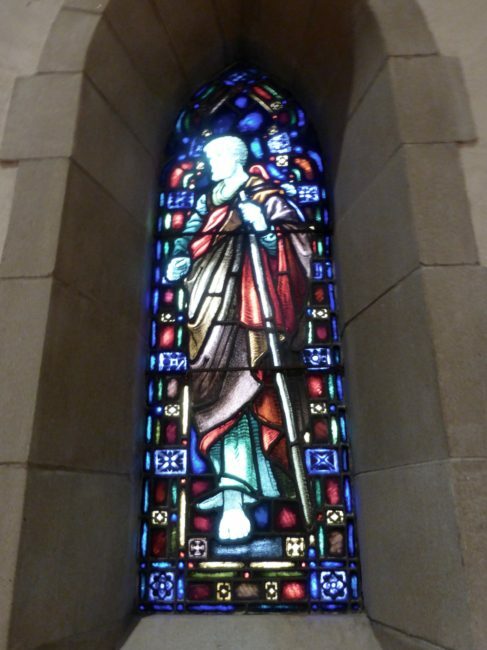 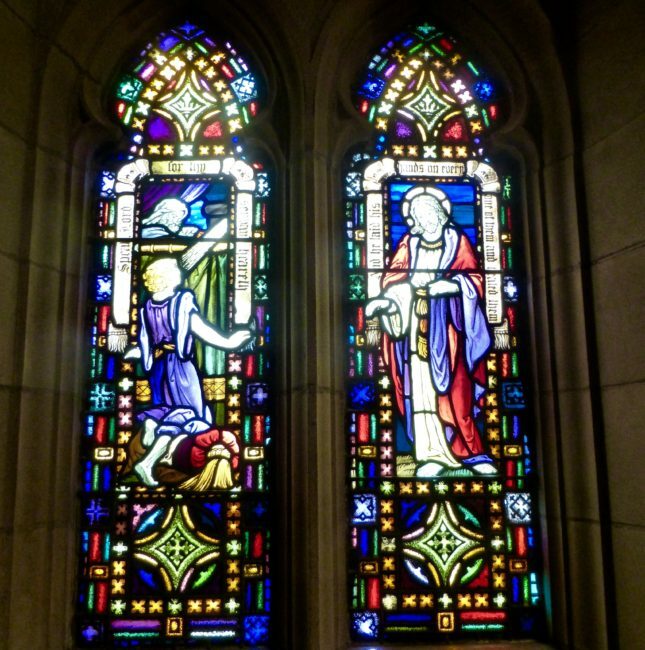 At the south transept was the Hugus Window depicting The Good Shepherd (window by Tiffany). 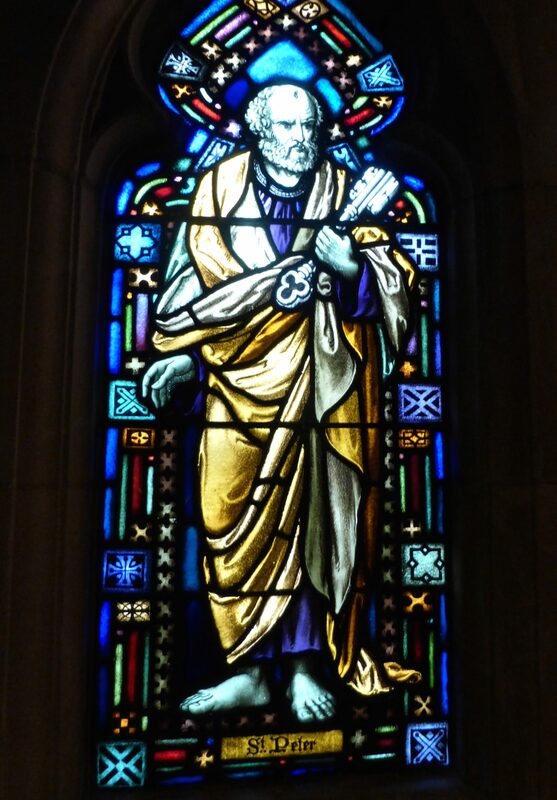 I think this is St. Thomas, but I’m always doubtful about him. 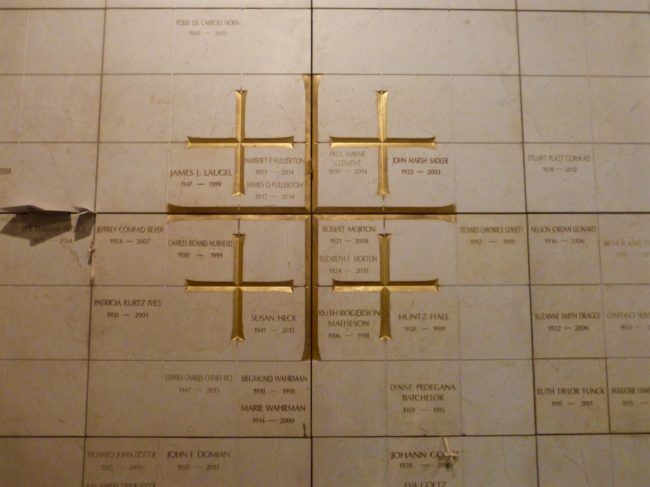 Can’t imagine why. From here, I entered the Webb Chapel, which has a carved wooden reredos. 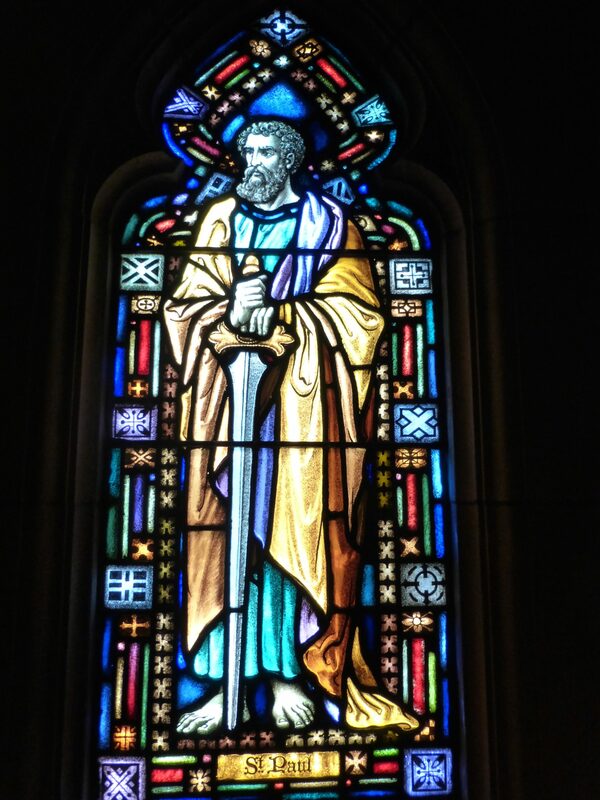 The stained glass is a little different in here, with the colors in cooler shades of blue and green. I made my way to the chancel, where I was probably not supposed to be, but I figured if lightning didn’t strike me it would be ok. 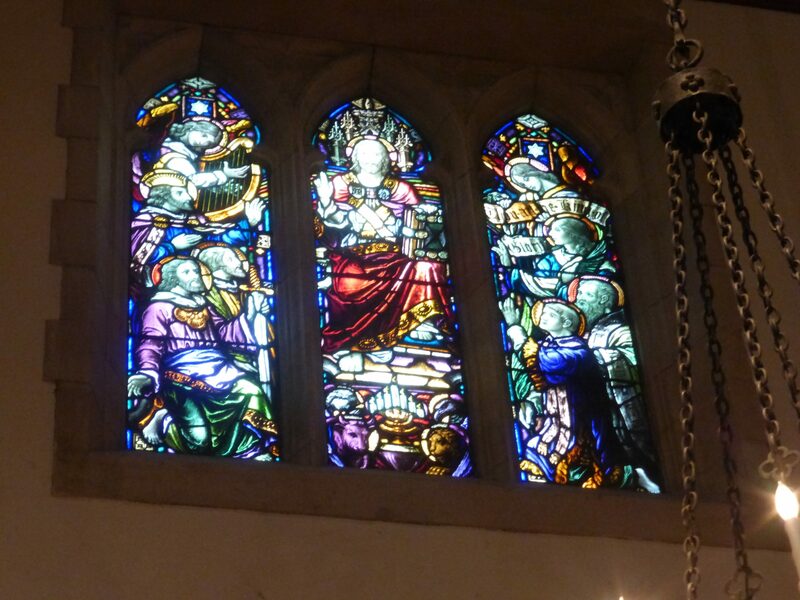 Behind the chancel is a gigantic stained glass window, the Myers Window. It was commissioned as a memorial to Mary Buchanan Myers, and although the figure in the window is pretty much the likeness of Myers, its purpose is to celebrate children. 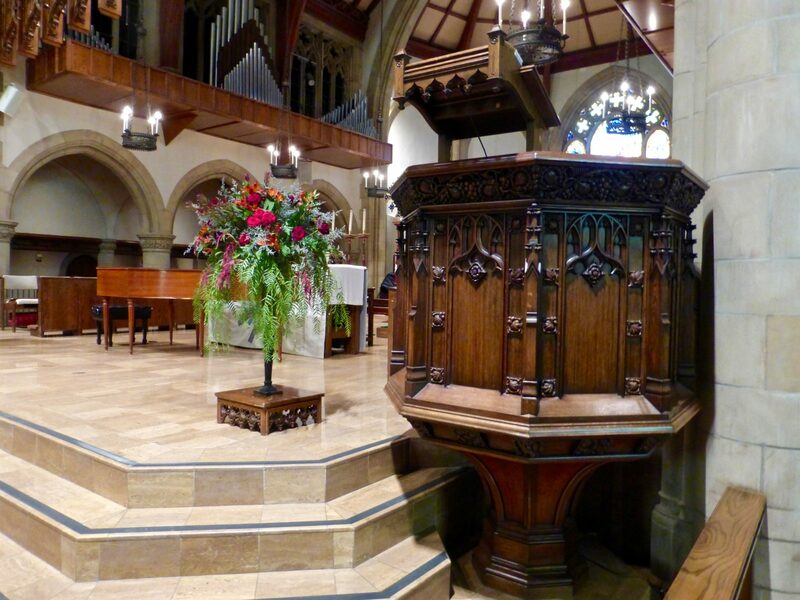 Be sure to view the woodwork at the front of the chancel, including the carving at the lectern and the pulpit. with its font that originally stood in the earlier church. The Presentation Of Christ Window is also located here. Walking into the north transept, the first thing you see is The Evans Window created by the Tiffany Glass & Decorating Company. 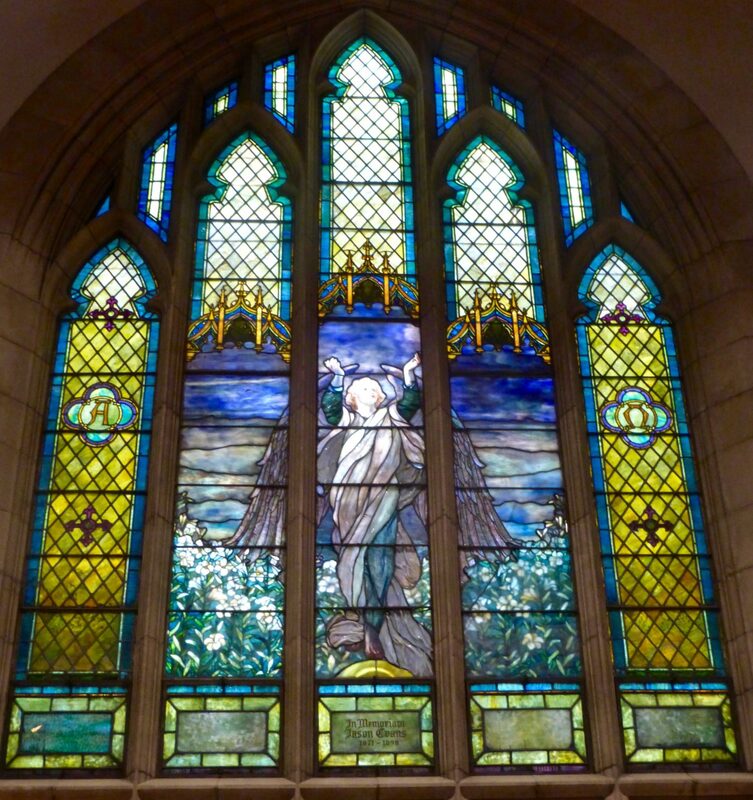 The Resurrection Angel was transported to Pasadena by train from New York. 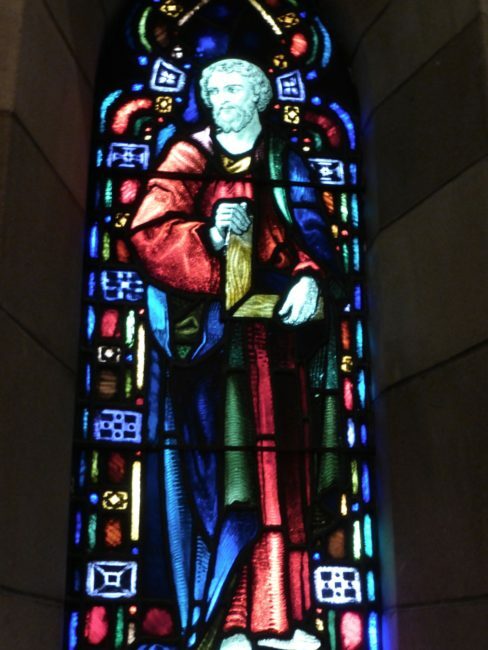 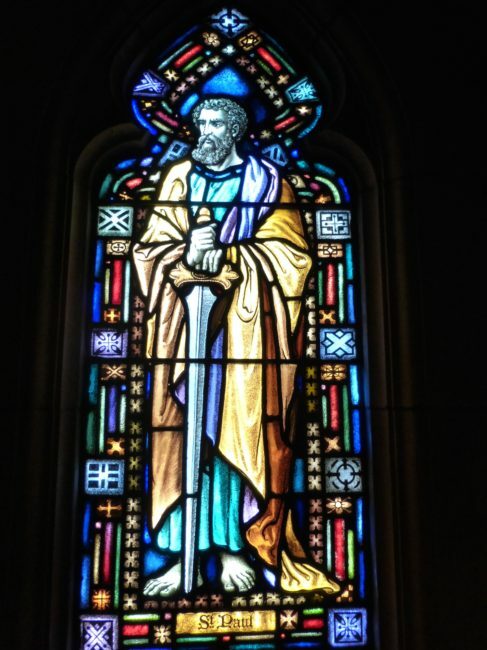 There is also a stained glass window of St. James. including the “multi-hued” Batchelder tile adorning the floor. 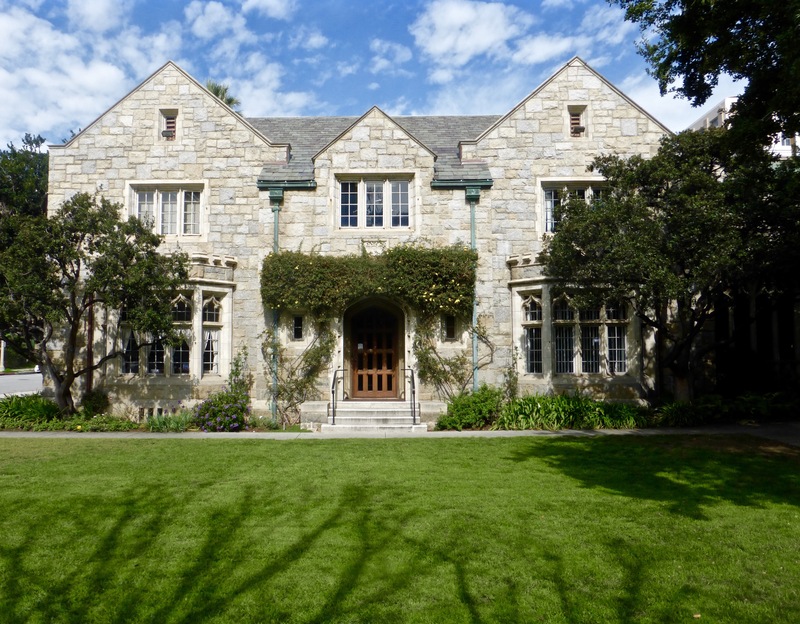 Ernest Batchelder was a Pasadena tile maker, famous for his tiles of the Arts and Crafts Movement. 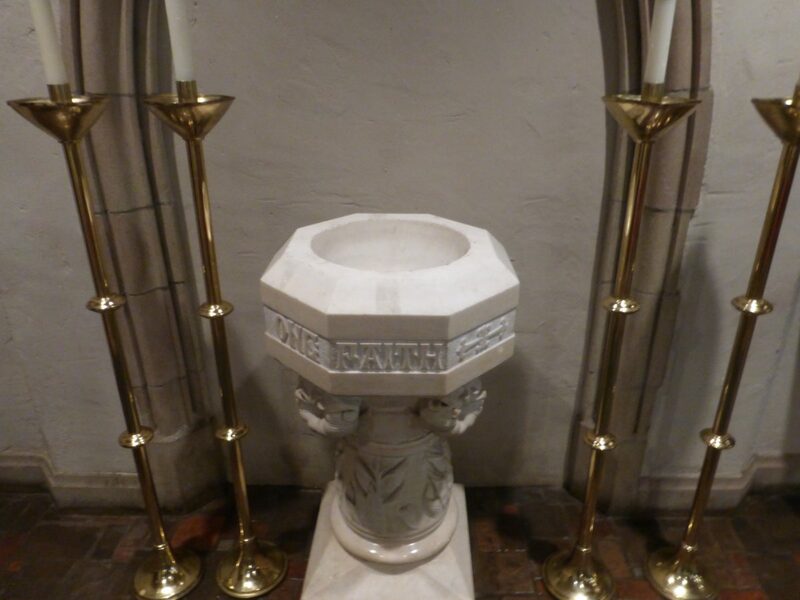 Our fireplace at home is a “Batchelder” fireplace. 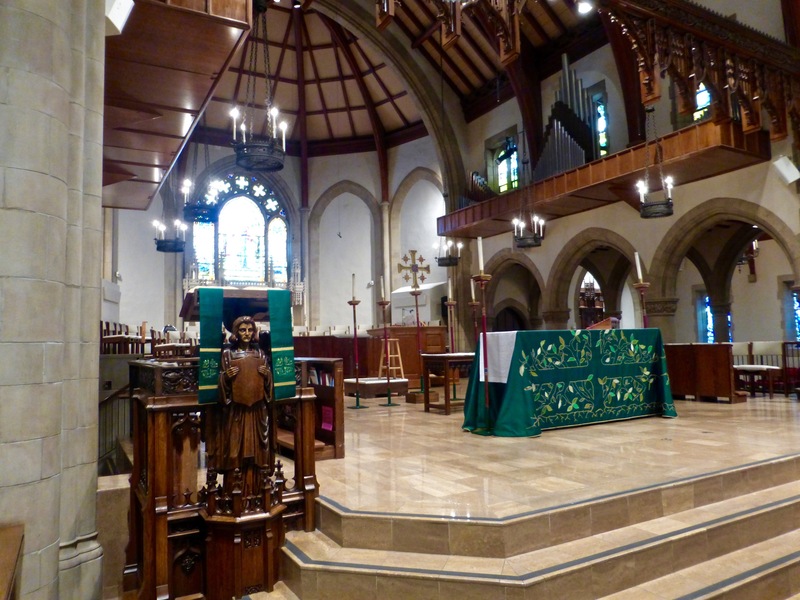 I stayed here for about an hour on my last visit, and only a few people stopped by to see this gorgeous interior. I glanced back at the interior of the church. Then I headed out to the north courtyard with its statue of St. Francis of Assisi. 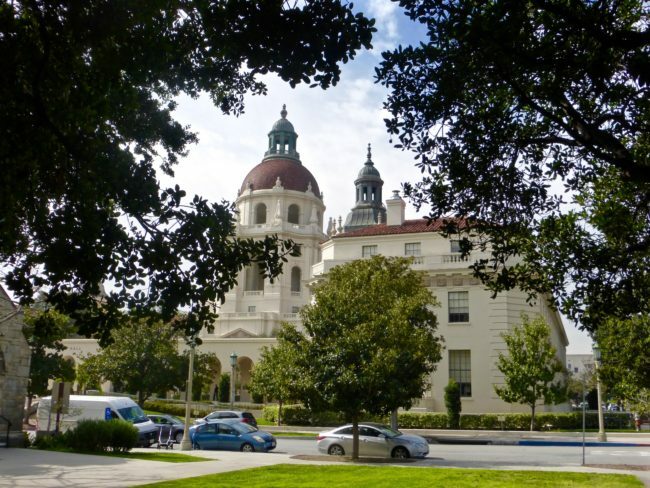 Across the street from All Saints Church is Pasadena’s stunning City Hall, completed in 1927. 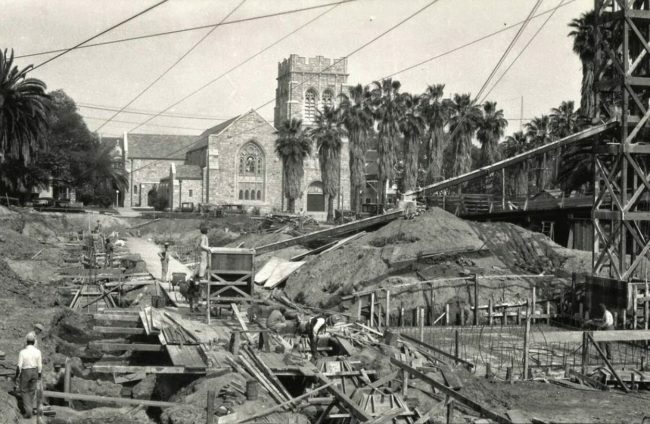 This is a photo of the construction of City Hall, with All Saints in the background. 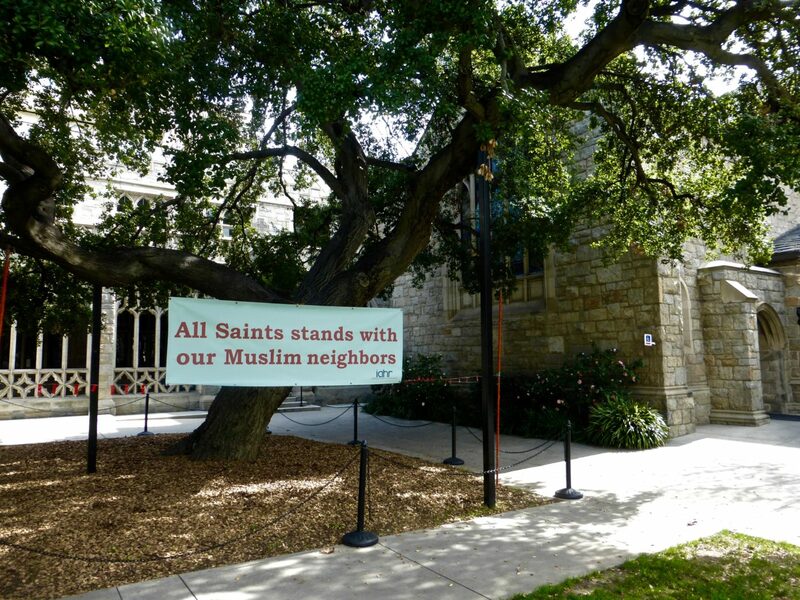 All Saints is considered one of the more liberal churches in the country and has had its fair share of controversy. It had a battle with the IRS (the church eventually prevailed) after a sermon where Jesus moderated a 2004 debate between John Kerry and George W. Bush. 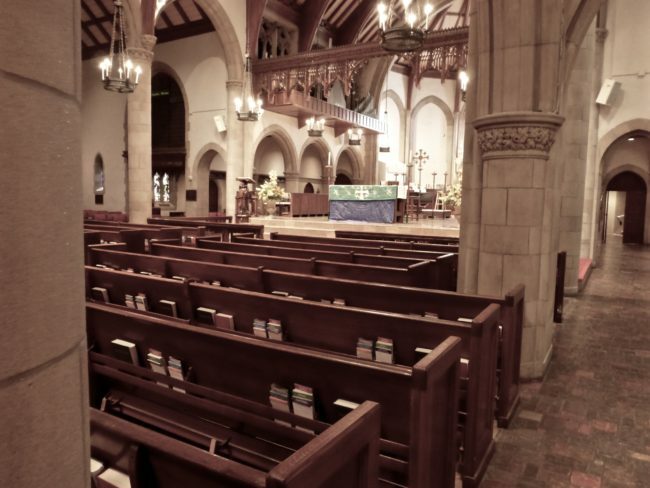 The church has a rich history of inclusion, including hosting gay marriages shortly after they became legal in California. As you can see, All Saints Church still proudly displays its doctrine of inclusion, as illustrated by this sign I saw at the church a few days ago. 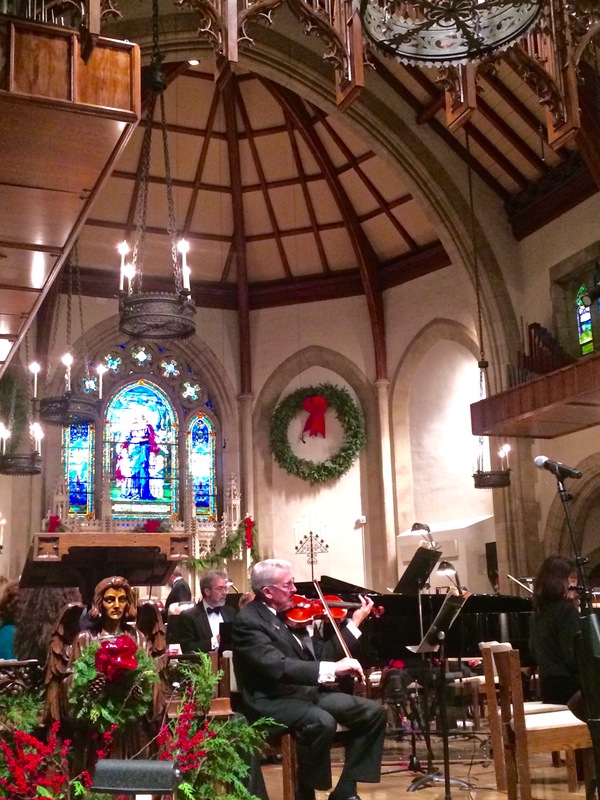 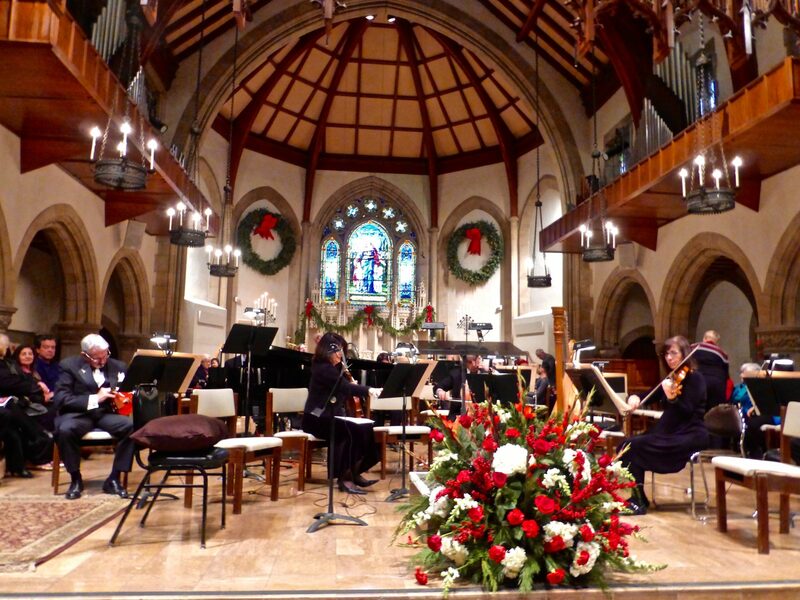 They also hold concerts here, including an evening of music during the Christmas season featuring the Pasadena Symphony and POPS. 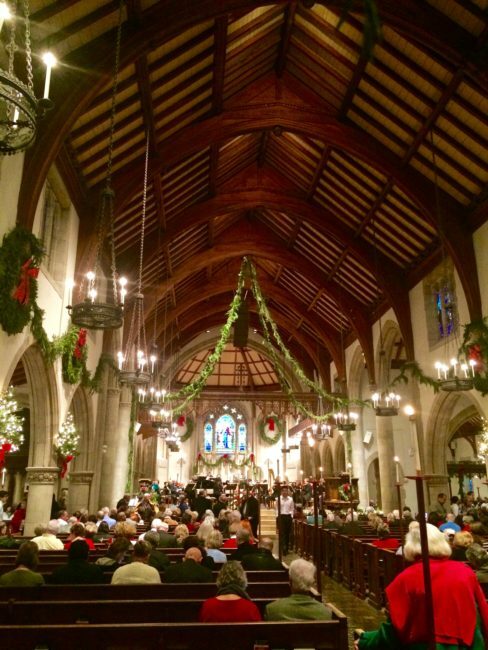 We attended one in December 2015, and it is truly a unique and wonderful experience. 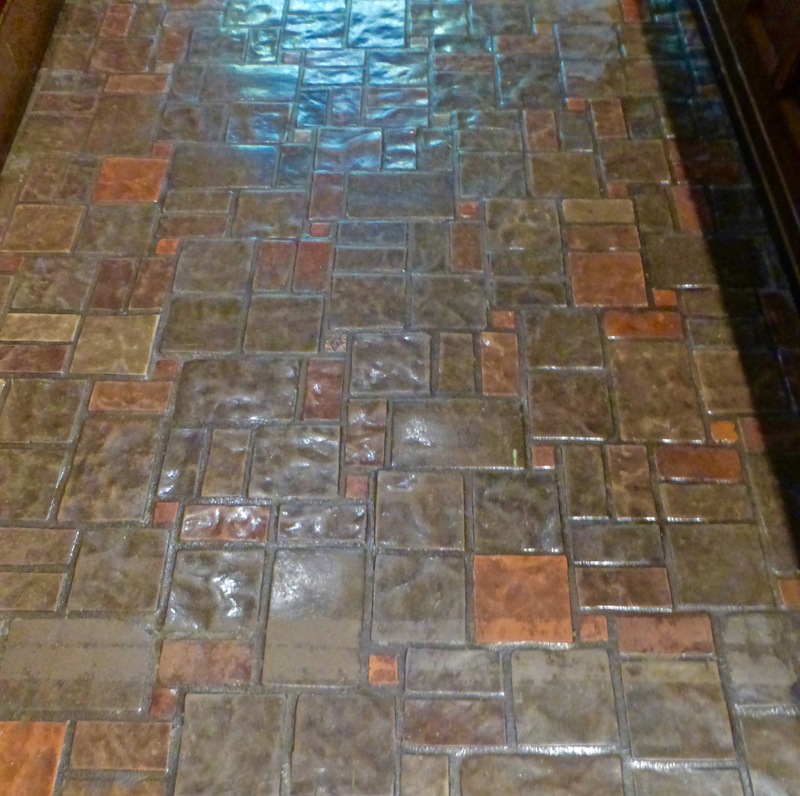 (FYI, for a good dinner afterward, walk the short distance to Alexander’s Steakhouse…best steak I have ever eaten). If you live near Pasadena or plan to be in the vicinity, this is another church that you should put on your radar. 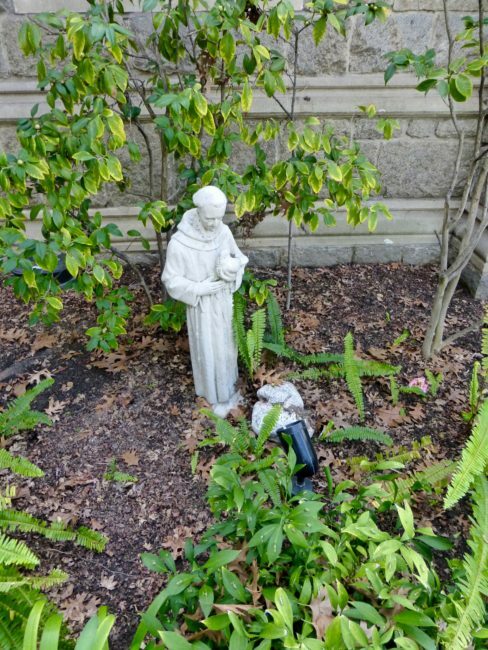 I’m always on the lookout for others.